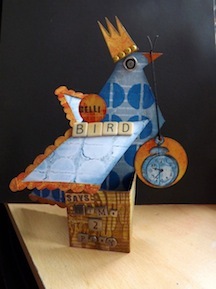 Just a couple of rubbish photos today – I waited too long to snap my plans for the day and it got dark on me. Funny how that happens so early this time of year! As you may recall I mentioned how I organize my patterned papers by creating “kits” of stuff that goes together, rather than trying to organize them by make or colour or pattern. 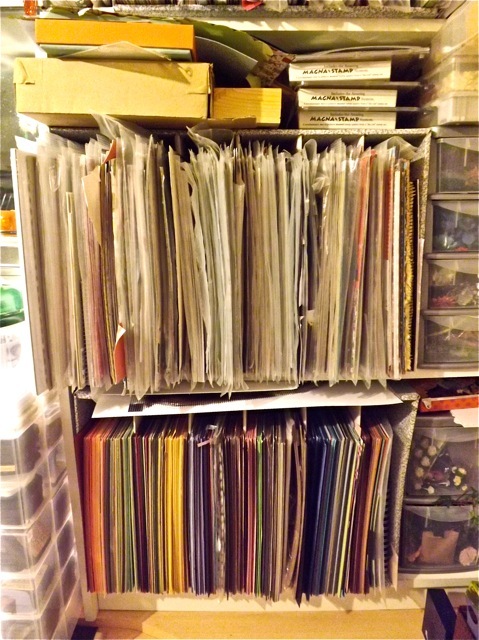 My paper and card storage looks like this – it’s not pretty, but it works for me. I use the ArchLever dividers as the 12 x 12 sheets fit perfectly. I get them from Staples and they are cheap – of course you cannot see them as stuffed as they are with …. stuff! They live in a small bookshelf that sits on the side of my desk. The bottom is all the coloured cardstock and the top two are my “kits” in plastic bags (you can only see the bottom two in the photo, card and one shelf of kits) and I just grab one when I am planning a layout. The real horror is the fact I have not made up kits for a long time. And I haven’t managed to sort my scraps either. Yes, THIS is what I plan to attack today! I urge yo to look away now …. Shocking? Probably not for WOYWW folk. But it is getting (has gotten?) out of control. So that’s me busy for the day. That and another follow-up with the Dr. I’ll be well happy when THAT is all done. 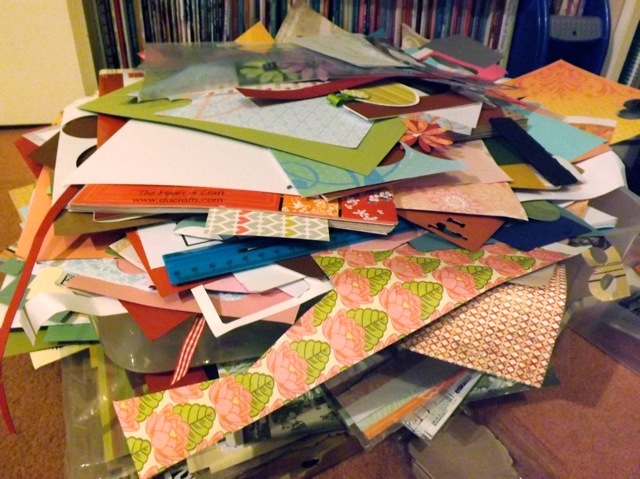 Between sorting I will be desk hopping, and praying SOMEONE is messier than me…but I am kinds doubting it.